What is biological filtration for fish ponds and why is it important? Biological filtration utilises good bacteria found naturally in every pond to convert toxic nutrients (Nitrites and Ammonia) to Nitrates, a nutrient low in toxicity which plants use for growth. This process is called nitrification. There are two types of bacteria responsible for this process, nitrosomonas and nitrobacter. In most fishponds, there are not enough of these bacteria to keep up with the nutrients being released by the fish in the pond, so a simple way of increasing the number of good bacteria has been found. Nitrosomonas and nitrobacter live on every surface of the pond, on the rocks, leaves, logs etc. So to increase the number of bacteria, we must provide them with a greater surface area to grow on. To achieve this, a filter box is constructed and filled with biological filter media. This filter media has a massive surface area to volume ratio, meaning that when water is pumped through the filter box, it goes past many billions of good bacteria, all converting the nutrients to safer forms. Biological Filtration is The Fish Works area of expertise. We have built filters for literally hundreds of fish ponds in NSW, tailor made to achieve crystal clear water and a healthy environment for fish to live and thrive in. We stock a wide range of biofilters for water features and fish ponds of all sizes. UV canister filters are the easiest way of filtering small to medium sized water features, up to around 5000 litres. These filters incorporate all the features of a good filter, removing solid particles, killing algal cells and providing good biological filtration. They are easy to install, but we can help you out with this if you wish. They are high-pressure systems, meaning that water can be directed to water features, such as fountains or waterfalls, with ease. The Fish Works only stock the best high-pressure filter systems, in the knowledge that they often work out cheaper in the long run, due to their longevity and generous warranty periods, plus they will perform much better than cheaper models. We stock and trust OASE, a German brand that is considered the best for at least 15 years. Their Filtoclear range are simple, yet functional in their patented design, making cleaning a breeze, and filtration effective. These guys must have gotten in early with their patents, because they are the only company allowed to have a simple handle that, when pulled up, squeezes out the sponges whilst backwashing, cleaning the filter from the inside without getting your hands wet. All of the other brands have ineffective or non-existent backwash systems, meaning you have to get in and squeeze out the muck with your hands! Yuck! Come into our shop and speak to one of us about which filter suits your pond. 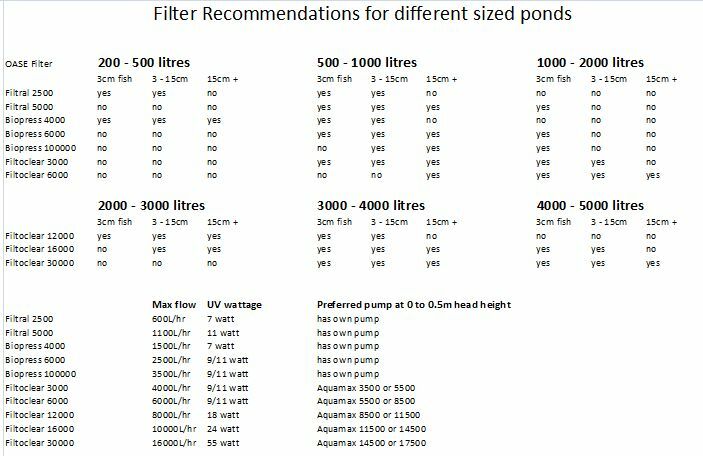 I have created a table below to help you understand which filter and pump will be good for your pond. If you have any doubts, please call us on (02) 9986 2000 and we will happily guide you in the right direction. 1. Huge surface area per unit, matte finish, good void percent and light weight. 2. Products come in negative or positive buoyancies. 3. Superior in performance with fewer biofilter media. 4. Excellent flow-through properties and does not clog up in the hardest of conditions. 6. Easy and simple to maintain. 7. Less cost and hassles with fewer maintenance frequencies. 8. Less cost in power usages and less backwash water usages. 9. Proven high performance in many high intensive fish farm recirculating systems across Australia. 10. And they are currently being used in Australian institutions for further applications in microbiology because of their advanced designs. Fishponds that receive more than a few hours of direct sunlight per day run the risk of developing algal blooms, which are both unsightly and can sometimes pose a threat to your fish’s health. Algal cells can rob your water of oxygen at night when they are not photosynthesising. Ponds that receive direct sunlight, particularly in summer, need U.V. filtration. This is because single-celled algae only need the smallest concentration of nutrients to flourish and turn your pond green in the presence of intense sunlight. This is why it is better to build a pond in semi shade if possible. Ponds that receive at least 3 hours of direct sunlight per day usually require additional filtration in the form of U.V. filtration. There are two types of Ultraviolet light filtration: U.V. clarification and U.V. sterilisation. Both work by the pumping of water through a cylinder containing an ultra-violet light, which radiates the passing water, having an effect on the single-celled organisms living in the water. The wattage and particular wavelengths of U.V. light determine the effect that this process has on the cells. Ultraviolet Clarification (U.V.C.) are generally on the lower end of the power scale, usually using somewhere between 5 and 25-watt globes. They are highly effective at clearing smaller fishponds of less than 5000 litres. They work by causing the algae cells to clump together, making them larger enough to get caught in the pond filter and hence die due to lack of sunlight. The process of clumping is known as flocculation.
. It radiates the passing water with a higher intensity U.V. light, killing any algal, bacterial and fungal cells. These units generally produce between 30 and 500-watts and are very effective in clearing the water in larger fishponds. Visit us, or call us to determine if you need a UV light filter for your pond. Whenever you clean your pond filtration materials, always use your pond water. This can be done by washing within a large tub, or by pumping water out of your pond. The reason for this is that we want to maintain as much of that good bacteria within the filtration media as we can. Washing the media in tap water kills the good bacteria because of the chlorine content.